I have a DX7S in pieces but it's coming together. I want to test out the cartridge functionality but I don't have one, nor do I have an ADP-1 (or is it ADP1? I know Yamaha is less with the dashes than Roland). I would be happy to pick up either a ROM or "RAM" cartridge at this point but I need to know what to look for. So, does it have to be DX7S specific or does a II/IIFD cartridge work in a DX7S? 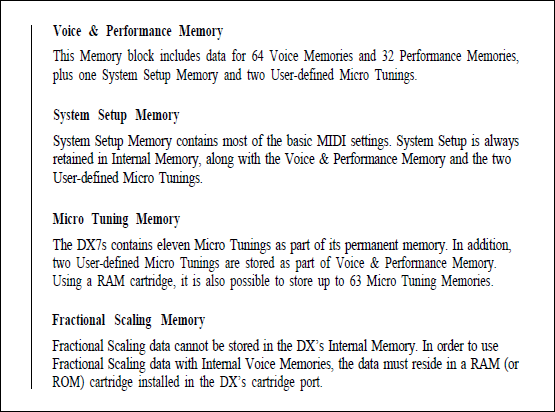 Also, if anyone knows the difference ... are the cartridge CT pins different between the DX7S and DX7II/DX7IIFD? I'm kind of curious about the ADP1 since it's so expensive. Like what's the pinout going on in there? I don't see a Service Manual for it. Maybe there is a FAQ someplace? RAM/ROM/RAM4/RAM5 ... how many different types did Yamaha make? Re: DX7S - Will the II/FD carts work? DX7II/DX7s can access 16 banks, AFAIK no one ever built such a card. The next RAM card series were MCD32 (V50) and then MCD64 (SY77). As you probably know, ADP1 is read-only, RAM1 has only 4K memory. Thanks! There are lots of web pages, but very few mention the DX7S. So as far as ROMs are concerned, ... as long as it's a "big" one (physically) then it should be OK? Obviously if there are drrum machine ROMs I will avoid those. I also saw in my searching that there is an ADP2, but it's not related in function for me. Yamaha DX7II Carts will work in the DX7S. But only the voice data, not performance data. I could be wrong though as it's been a long time since I had a DX7S. I now have a TX802. Cartridges available for the DX7 MKI will work as long as you have an ADP1 cartridge adaptor, as DX7 MKI cartridges are a smaller size.